Elegant fitted lace bodice with unusual inverted V strapless neckline, breathtaking train, satin wedding dress. Featuring delicate button up back with hidden zipper and built in corset. 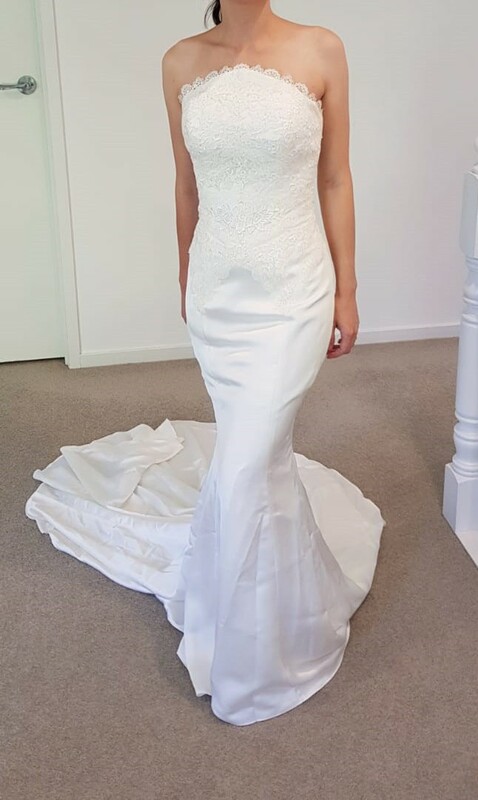 Bought from Abbey Bridal in Sydney. New, never worn as we changed the style of our wedding and I ended up needing something more casual. Altered from a size 10 to an AU size 6, with bra cups added and option to bustle. Hemmed for a 162cm or 5ft 3 woman, but hemmed for wearing 3.5-inch heels.